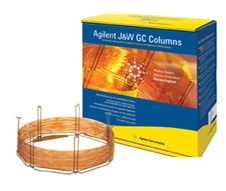 Agilent J&W DB-UI 8270D GC columns deliver excellent peak shape performance for active semi-volatile organic compounds targeted by EPA Method 8270D, so you can perform environmental trace-level analysis with the utmost confidence. Agilent’s leading-edge manufacturing process, combined with optimized chemistries and design advancements, improve both inertness and column-to-column reproducibility with no trade-offs in bleed or stationary phase selectivity. All Agilent J&W DB-UI 8270D Ultra Inert columns are individually tested with the most highly probative semivolatile compounds – such as propanoic acid, pyridine, 1,2 butanediol and 1-chloro- 2-fluorobenzene, m/p xylene at low temperature (45 °C) – to ensure excellent peak shape performance at low levels (5-10 ng on-column).